After coffee and some chit-chat it was off to see “Tell us Your Plans, ask us Your Questions” with the wife and Tony Cassidy. This was a question and answer session about Oracle Cloud Apps and I just wanted to keep my ear to the ground. I popped over to the social event, to catch some people I hadn’t spoken to during the day. 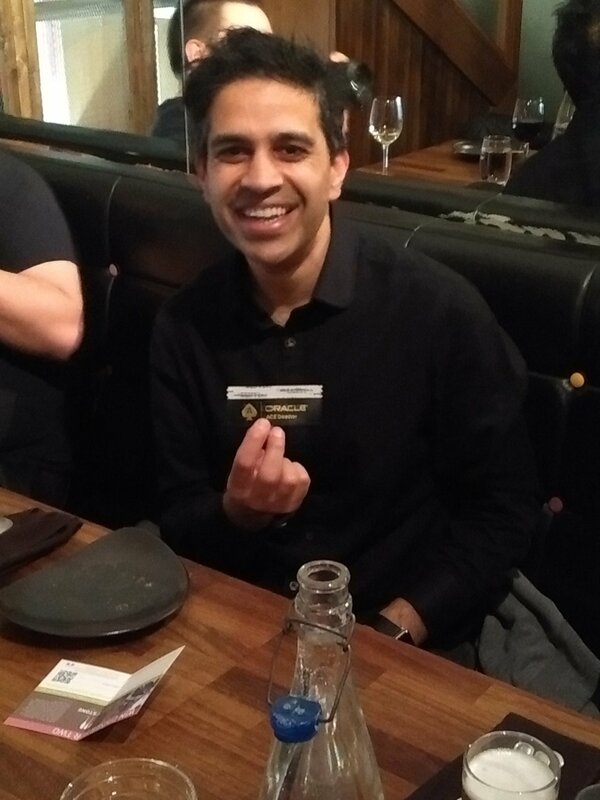 I was going to duck out of the ACE dinner as it had been a long day, but Brendan persuaded me I should go, and I was glad I did because it was announced that Kiran Tailor is the latest person to be made an Oracle ACE Director. Kiran is a super-nice guy, so I was pleased this happened. Once we had eaten, I walked the wife back to her hotel, and bought her an ice cream, then headed off to mine to crash. What a long day! Previous Previous post: Paying someone to learn for you?